JUST A HOP, SKIP AND A JUMP . . .
. . . From the North Carolina Zoo and other fun things to do! We're experienced RV Park owners and we're making this park better every day. So stay with us and enjoy improved sites and amenities at a beautiful resort setting. The roads into the park and in the park are good. Second time staying here.. We arrived after hours and information was left for us and finding our site was easy. Check in the next morning was fast and friendly. Large park with over 100 sites, both camper and tents. The park is quiet and well maintained. Sites are gravel and average width. We were in Site 21, level with full hook-ups and no issues with them. There is a picnic table, fire ring and shade trees. It was plenty long enough for our 37-foot Class A, tow-dolly and parking the car. 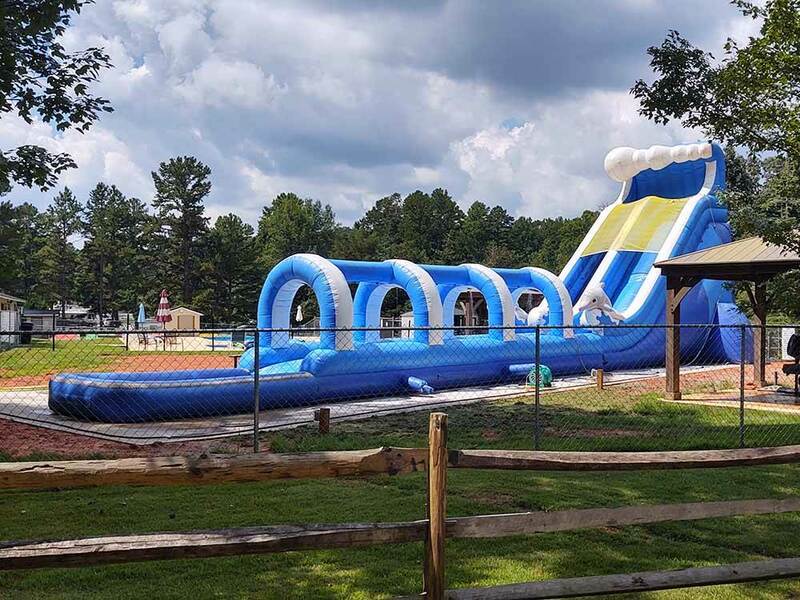 There is a pool, playground, inflatable jump pad, game room, fishing pond and more. The trails around the park are great for dog walking plus there is a fenced dog park. Laundry and bathrooms were clean. There is no WiFi, which is why we rated it a 4 and not 5, Verizon signal good. We stayed May 2 - 6, 2018 and paid $31.15 a night with our Good Sam discount. You are about 10-mminutes from the North Carolina Zoo. I stayed at Zooland with grandchildren chose campground because of close proximity to NC Zoo. Little disappointed with overall appearance of grounds cigarette butts everywhere and bathrooms and laundry facilities were in poor condition . Our campsite was also littered . No wi-fi or cable tv . Only positive note is location . First time staying at this CG. Campground was very crowded, many kids on bicycles and golf carts. My site was muddy on connection side and never dried out, even though it didn't rain our last 4 days there. Sewer connection was slightly higher than camper, never a good situation. Campsites very close together. Our neighbors sewer connection was right outside our door. Dumpster was overflowing, emptied, and overflowing again 2 days later. Advertises WiFi, wrong! Manager told us it's not strong enough and can't handle the usage. Even in middle of week when CG was half full WiFi not available. If you want to use the pool, be there at 10am when it opens, otherwise good luck finding a place to sit. On a positive note, store is well stocked with a good assortment of food, supplies, and camping needs, but has short hours. Closes at 3pm. Check in after that????? What if you need propane? Call the number on the door. Not open late enough period. The 2017 Good Sam RV Travel Guide gives Zooland Family CG 8.5/9*/8.5 which is why we made a reservation there. Overall I believe this CG is average at best. May be an ok place if you have kids and don't mind be crowded. Campground was very clean. Large spaces. Staff very nice and accommodating. Memorial Day weekend stay and the prices were very reasonable. Will be going back. The road in from Hwy 220 is narrow and rough in places so be careful. Watch for the propane gas sign to see the entrance to the park. We stayed May 20-25, 2017 The staff that checked us in was very friendly and helpful. The camp has over 140 sites, a mix of campers, RV's and tents. There are a number of seasonal residents, but most are well kept. Some of the roads in the park are pot holed and bumpy. Sites are gravel and grass and not very level, we were in site 12. They include a picnic table and a fire ring. We had full hook-ups with 50 amp and good water pressure. There is no WiFi. Our Verizon MiFi worked well. There is plenty to do - a pool, putt-putt, trampoline, basketball, game room, catch and release pond, and trails. The store is stocked with basic needs and gifts. The laundry room was okay. Did not use the bathrooms. We paid $29.00 a night with a combination of Good Sam and Passport America discounts. You are about 15 minutes from the North Carolina Zoo. The campground staff is very helpful. Sites are generally level and easy to access. The only drawbacks are that the wifi is very weak and cell phone service is almost non-existent. Restrooms are heated and very well kept up. This was our second stay at Zooland, unfortunately it will be our last. The bathrooms seemed to be a bit cleaner this year, but not much. The HUGE problem was the FLEAS. We were assigned to a site next to what appeared to be a permanent camper that obviously didn't take pride in their campsite. It was cluttered and dirty with large dog poop laying about around their campsite and under their awning. Within one hour of setting up our campsite, I found fleas on my two dogs. They had no fleas prior to our arrival. They were freshly groomed and are always on flea prevention medication monthly. On our return home we discovered fleas in our RV, on our bedding and our dogs which then transferred to our home. We had to take them for treatment at the Vet, fog our home & RV and are finally rid of them almost a week later! In addition to the flea issues, the campground in general does not appear to have rules or standards in place for permanent or long term campsites - most were not very neat. Zooland has teenagers cleaning the bath houses which is probably why they aren't up to a 4 or even 5 star rating. It appears they are only cleaned in the morning. And, we never saw an owner/manager/worker, etc. roaming the campsite to see if all was well or to even say hello. They do have fun Halloween activities for adults, children and even a pet costume contest - which is nice. But the flea infestation within an hour of our arrival is a definite deal breaker for us - we won't be back. Lots for the kids to do! Kids love the pool and the jump pillow! Bathrooms look nice and redone. We have stayed several times now. Only complaint is some sites require lots of leveling and the amenities close a tad early. The wi-fi only worked part time and was slow. I needed to keep in touch with business was unable to. There is no TV cable and you are unable to get good satellite or antenna service because of all the pine trees that need to be thinned out. Would have liked to seen a suggestion box so I could address the problems directly. The laundry facilities are very old and worn out, Really needs to be updated. sites are very un-level Bathrooms are clean over all. Would have liked to seen a suggestion box so I could address the problems directly. We love coming here. The restrooms are clean but need more ventilation or a/c. Plenty of things for the children to...the jumping pillow, basketball, bike riding, swing set, game room, and miniature golf. Friendly staff. Good planned activities for the children. This is our third visit and we'll be back next year. We've stayed at Zooland twice in the last 2 years. Pro's - There's a nice wooded area for hiking. A river runs along the wooded area. The kids loved wading thru and walking over the rocks. We captured some great pics. Kids enjoyed the jumping pillow, mini golf & basketball court. 1st visit campground was only 1/2 full, so peaceful & pleasant. There's a building with a nice deck for gatherings. An RV club was having a potluck & looked to be having a great time :) Campground is only 45 mins from home. Con's Sites are tight, longer in length than width. Our picnic table was 3 ft from the sewer hose of the next camper. Not a nice atmosphere for dining. Campground was full on our 2nd visit and there seemed to be a lot of permanent sites and more of a party atmosphere. That took away from the campground feel that we enjoy. There were lots of kids running around unsupervised. One group was playing baseball near the campsites with a plastic bat & rocks. Yikes!! We have friends that like to stay there so it's possible we just picked the wrong weekend 2nd time around. I probably would not plan a trip there again unless we were just desperate for a last minute trip nearby. Nice sites. Easy pull-through and mostly level. Clean bathhouse. Pretty quiet except it is on a relatively busy highway. Close to town and zoo. I have used this park in my north/south travels for the last couple of years. Sites are level, so I don't have to unhook. Park is far enough from highway to be restful but close enough to be convenient. Employees are very friendly and helpful.